I haven't had much to blog about this week. I'm now back at work and the little knitting I've done has been to work exclusively on the border of the Jigsaw Afghan. I'm getting close to finishing and looking forward to starting on a design that's only in my head at the moment. For my first attempt at working the border I picked up stitches all around the edges, 20 stitches along each block for a total of 1,280 stitches. I increased two stitches at each corner on every other round to ease around the corners. After I'd done about 8 rounds I noticed that I'd caught the edge on something, broken the yarn and as a result there was a hole. An unfixable hole, unfortunately. I ripped out the entire border but I can't say that I minded. The 40-inch circular needle was full and there was barely any slack to knit the stitches. It was very slow and arduous, moving the stitches around the needle. For my second attempt I decided to knit one side at a time: 380 stitches on each of the long sides, 260 stitches on each of the short sides. This was so much easier, and quicker. 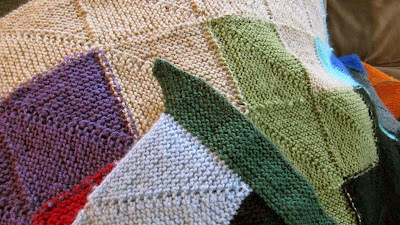 The border is dark green, knit in garter stitch with increases on each end of every other row. When the four sides are finished I'll work a seam up the center of each mitered corner. I have two sides finished - two sides left to go plus I need to weave in the ends on the outer blocks. After that, it'll be put in the mail as this is a gift. I'm betting that I'll make another one for myself someday in the future. Just a reminder that there is a Jigsaw Afghan knitalong group on Ravelry and we'd love to have you join us.